I”ve had the pleasure of having many conversations with Mike Manos at various data center events, and discussing how data centers need to be built. The latest vision was explained in Mike’s post on generation 4 data centers. 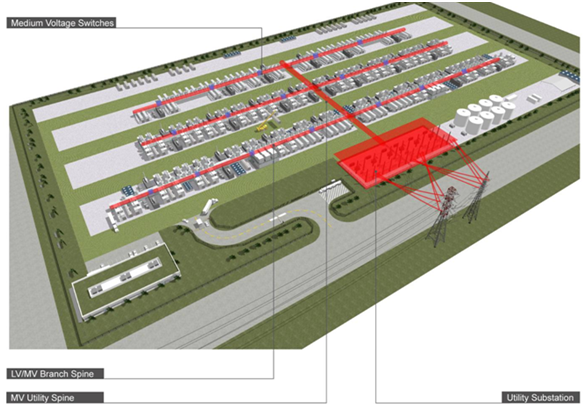 Our Vision for Generation 4 Modular Data Centers - One way of Getting it just right . . .
Data Centers are a hot topic these days. No matter where you look, this once obscure aspect of infrastructure is getting a lot of attention. For years, there have been cost pressures on IT operations and this, when the need for modern capacity is greater than ever, has thrust data centers into the spotlight. Server and rack density continues to rise, placing DC professionals and businesses in tighter and tougher situations while they struggle to manage their IT environments. And now hyper-scale cloud infrastructure is taking traditional technologies to limits never explored before and focusing the imagination of the IT industry on new possibilities. What led Mike to this vision was he had a complete team. His team ran data centers, builds data centers, and designed them. This holistic view allowed Mike’s team to think about the complete lifecycle of a data center, and question the existing standards. As much as people think about changing data center construction, the secret to Mike Manos’s technique was how the team was organized. Think about how your data center teams are organized and can they question the existing data center methods. The data center industry is poised on a transition. What is the most efficient way to deliver information. The most efficient is going to have the lowest costs to provide information services. The rapid growth of netbooks and mobile devices is make the data center’s role more important. We can thank Mike for showing how data center organizations should be organized to be innovative. Here is Mike’s role at Digital Realty Trust. In his new position at Digital Realty Trust, Manos will oversee datacenter design and construction across the Company's global portfolio of properties as well as oversee Technical Operations for the organization. Are you ready to change your data center organization? Oh yeh. This also means you need to question your whole data center supply chain as well. Who are the right supplier/partners to build the efficient data centers?